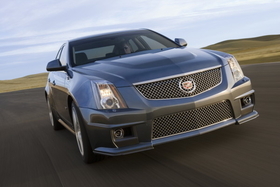 Cadillacs could get GM's hybrid powertrain including the CTS, shown. DETROIT -- General Motors Co.'s Two Mode hybrid powertrain, used only in trucks, will migrate to rear-drive cars in the next generation, said Tom Stephens, GM's vice chairman of global product operations. Two Cadillac models – ATS and CTS – are likely candidate to get the system, says consultant Jim Hall of 2953 Analytics in suburban Detroit. Last month GM said it is developing an electric motor that is 25 percent smaller and 20 percent more powerful than the motor used in today's Two Mode hybrid full-sized trucks. The new motor will debut in 2013 in GM's next-generation, full-sized trucks. "The new motor will be lighter. It will be more affordable," said Stephens. Because of the smaller size, he said, GM also will use those motors in cars. Hall expects the next-generation Two Mode hybrid system to be offered eventually on the Cadillac ATS, a rear-drive Cadillac smaller than the CTS. The ATS is expected to go on sale in the U.S. next year. Hall expects that the next-generation CTS, scheduled for 2012, eventually will offer the next-generation hybrid system. Today, the full-sized Chevrolet Tahoe, GMC Yukon and Cadillac Escalade SUVs and the Chevrolet Silverado and GMC Sierra pickups are the only GM nameplates available with the Two Mode. Their electric motor is assembled by Remy International.